Creating your own wedding cupcakes is easy because they’re simple to bake (single serving sizes and no worrying about tiers), plus the frosting doesn’t have to look as polished as it typically does on a big wedding cake. In fact, the most charming cupcakes are usually those that look like they came out of a real kitchen, not some high-tech baker’s mecca. They note that when you do thaw them, unwrap them first to prevent the buildup of condensation that can turn a cupcake gummy and gross. As to how long you can freeze your cupcakes, it depends on the kind of cake. Cakes with a butter base (like yellow cake) can be frozen up to six months, but I’d recommend keeping them frozen for no more than two months. Angel food cakes can be frozen for up to two months, but should probably be eaten before then. Natural essences will freeze better than artificial ones, and the flavor may grow stronger over time. 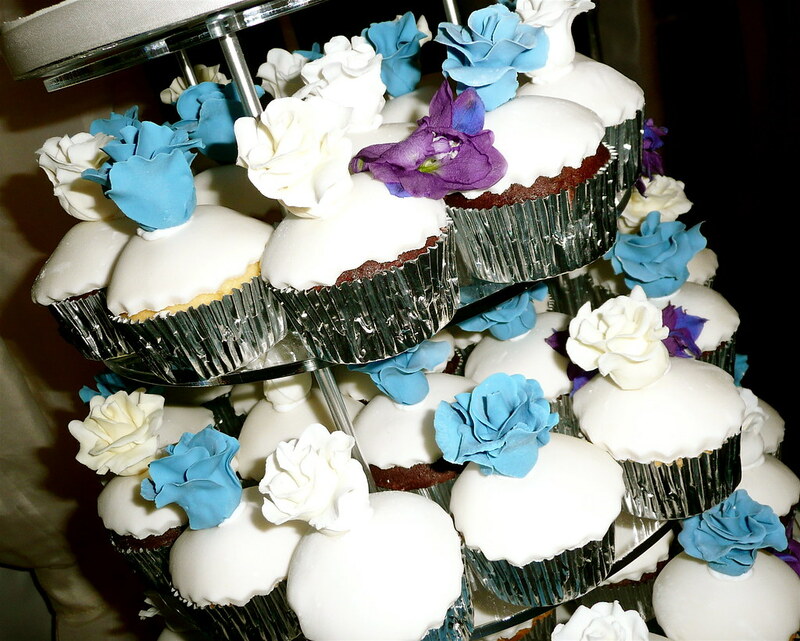 I believe the bride's grandmother made the cupcakes in the photo! Not too bad, eh?